This past month I have done a fair amount of blogging, posting at least one post a day. 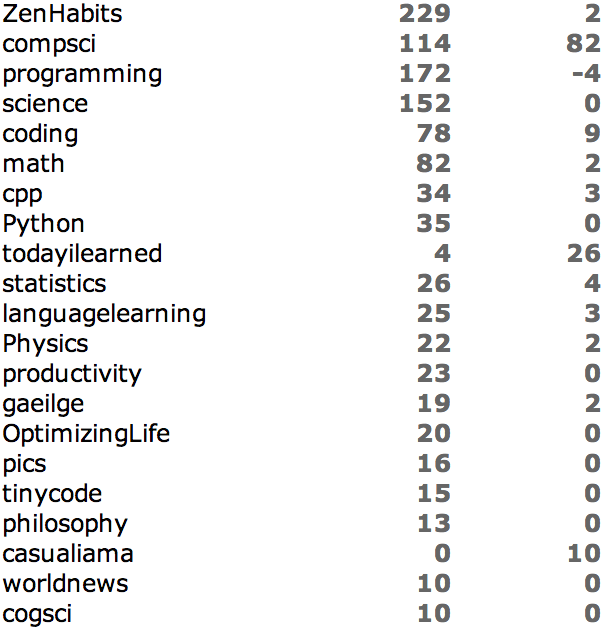 Most of them have been educational focusing particularly at my coursework: Systems Programming, Numerical Analysis, and my OpenBKZ project (which was also a project for my class, two birds one stone and all). I also had several posts on partial subjects such as Computer Vision (related to my senior thesis), learning, a bit of neuroscience, philosophy, and self-improvement. I have learned a lot from blogging and I believe it is an excellent way to improve your intellect and help remember complex topics. Part of my recent push for blogging has been to experiment with how much it can improve my learning. The other part has two parts, (1) improving other peoples lives and (2) gaining a decent number of subscribers. Both are fairly intertwined, you need to have a reason people want to read your blog to obtain subscribers. 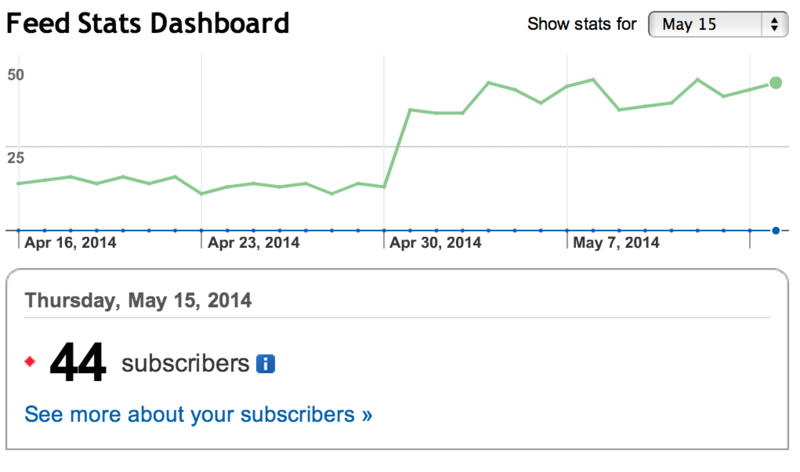 My goal this month was to produce thirty new high quality blogposts/articles as well as commit to github every day. I missed github one day due to exams, so I came pretty close there. As for articles I intended to write on interesting topics for the first two weeks, following up with a push into Reddit, Hacker News, Twitter, and Facebook. With this in mind, lets reflect on how well I have achieved my goals. Ouch, these two weeks showed a decline, (but more returning visitors!) then again I really was not posting my articles very often (I believe twice on hacker news). The articles were not very successful and I’ll call this the “improving stage,” during which time I began monitoring Reddit and Hacker News heavily to determine how to maximize impact. Several years ago I remembered reading an article which discussed when to post to reach the front page of Hacker News. Turns out it was still relevant, over the past two weeks I have made it to the front page three separate times, as well as March 30th and 4th – 5th (though I didn’t post all of those times). If you would like a full history here is the search, I would like to apologize for my “spam” which I believe is fairly high quality, but constant none the less. In either case, the experiment is over and I shall stop. A marked increase, but not nearly enough to call it successful. I am rather disappointed and hope by next month I can improve my content and increase my subscribers. Twitter growth has been moderately weak as well, I have gained 22 twitter followers since May 1st and will update this post when I can get some better statistics. My goals for next month are going to be expanding and begin using #’s on Facebook and Twitter. Shameless plug: /r/OptimizingLife is also a subreddit I recommend anyone into maximizing learning joins, it’s a subreddit. I made about a week ago focusing on applying science and analysis from scientific fields to knowledge and learning, since I got kind of sick of the: 7 ways to be better titles (give me the research!). Clearly, this is more improvement that could be made on Reddit, however this does not tell the whole story. Several of my posts were posted before I could post, which shocked and excited me! Simply adding two to three images will dramatically improve up votes, but not bounce rate. My assumption being people enjoy the pictures for ~5 seconds and up vote you if they look nice, some may have even believed they learned something. A sweet spot is around 500 – 1200 words, after that people start to lose interest. Remember blog posts are often read the five to fifteen minutes between bus stops, class starting, or lunch. I have had several comments such as “Came for the Monte Carlo Methods, stayed for the Markov Processes” or “Intro to IPC was interesting, but I really thought it was a good idea Sockets had their own post.” The point being people will click on links if they enjoy your post or do not understand something. Keep them reading by [blocking] (i.e. ) citations and linking your articles. I believe I will keep blogging for the next few months and will try cutting the Reddit and Hacker News spam to a minimum, rather focusing on Twitter, Facebook, and StumbleUpon (saving only the best posts for Reddit/HN). I hope someone found this insightful and feel free to add suggestions! My metrics (bounce rate, time on page, pageviews) are almost the same — You’ve got me beat by about ~2% on bounce and I’m only at about a quarter of the pageviews. That should be “I’m only at about a quarter of the total pageviews.” Pageviews per visitor is about the same. I have a few articles popping up in searches i.e. Markov Processes is usually really high and random other words you have to type in. I am going to try to write more unique articles that will be the only ones. 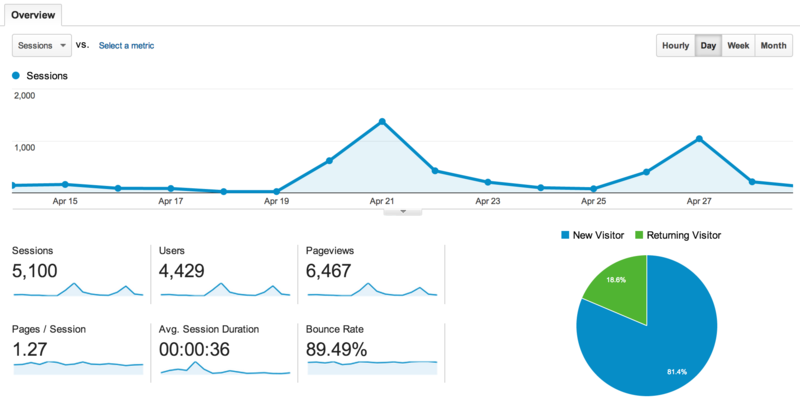 I have also been getting excellent traffic from courses at UIUC since many of my posts are more or less notes (usually greatly improved to the lectures). I am guessing this is why I have a slightly lower bounce rate. I also had quite a few blogs repost my content, especially stuff with algorithm/code. Further, I have been posting in a staggered way. I’ll post on one subreddit one day and another a couple days later for the same subject, and I’ll manage to keep the posts on the top of one subreddit for 5 – 7 days (I think this boosts Google Ranks). It was very very effective. I haven’t post anything for a couple of days and I’m still receiving a ~1000 views a day so it seems to be working. 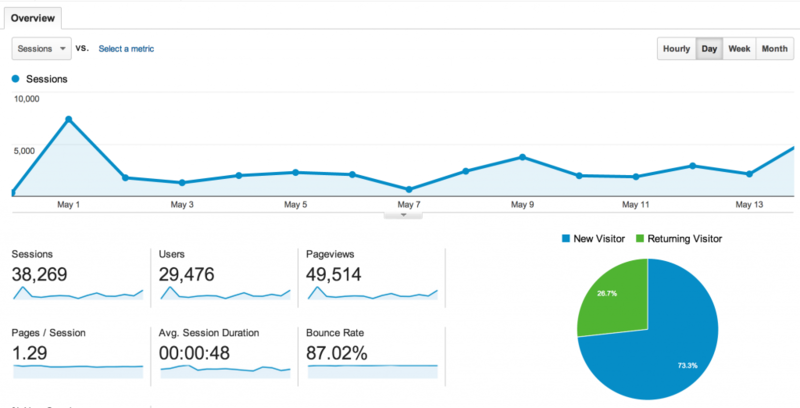 I haven’t ever considered the science behind getting people to read a blog. I thought it was all about content, keywords, and links from other sites. I had no idea it was affected by what time a post was uploaded! Do you have advertising on this site? (I don’t know because I use Firefox with the add-free add on). Is this a source of income for you, or do you just do it because you like to share your knowledge?